The Iowa Department of Education, Iowa Public TV, the University of Northern Iowa, and the Center for Literacy and Disability Studies at UNC Chapel Hill partnered to create a new and exciting resource. 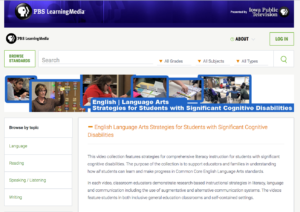 On the site, you’ll find videos of teachers engaged in reading and writing instruction with students with significant cognitive disabilities. The students range in age and significance of need (including students who use AAC). There are also examples of many different types of classrooms. In addition to the videos, you will find information about the DLM Essential Elements addressed and links to additional resources. Professional Development for the Dynamic Learning Maps Alternate Assessment is provided by the Center for Literacy and Disability Studies at the University of North Carolina at Chapel Hill.